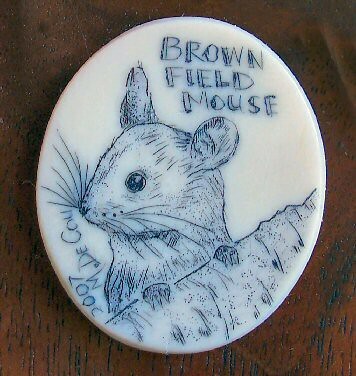 I remember well the first time I ever heard the word “Scrimshaw.” I had gone to visit a very nice man that lives in my area of the Kansas Flinthills, and he used the term. 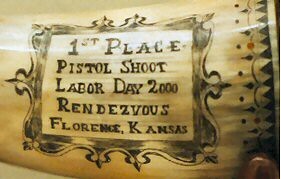 I had been transplanted from Wichita, KS earlier that year to work on a Men’s Ranch near Florence, KS called Morning Star Ranch, a ministry of World Impact, Inc., to teach woodworking and carpentry. Since I was new to the area, I wanted to meet some folks and get involved in what they were doing in the area. There are a lot of folks around here that shoot black powder guns, and re-enact history in the “Mountain Man Era”, so I decided that I would also. This was in the 1998-1999 timeframe. As a kid, I pretended to be Davy Crockett, or Daniel Boone, most kids my age did in those years. So, my doing it as an adult sort of fit my childlike mind anyway. As for black powder shooting, I didn’t know a thing about what I was doing, or going to do. Naive, they call that. To learn about black powder guns, I went into the local gun shop/men’s hangout and asked about what I needed to shoot black powder. I felt pretty silly. So, I got directions to Larry’s house from Cliff, and traveled to knock on his door. Larry has a large ranch, with exotic animals, and it is a really cool place. There are remnants of fun things laying everywhere, piles of antlers, inventions he is developing, steel shooting targets, vehicles he is making into something else, farm equipment, and other things a rancher has at his place. At the time, he even had a real fat little racoon that he had in a big cage that he would talk to like it was a little baby, with a sweet little high pitched voice, and give it food to eat. He just loves animals. After I knocked, a lady (Nancy) answered the door, I introduced myself and said that I had been sent to see “Larry” about learning to shoot blackpowder. I could tell by her body language and the tone in her voice, that I wasn’t the first disciple to show up at her door to see Larry about how to make something. 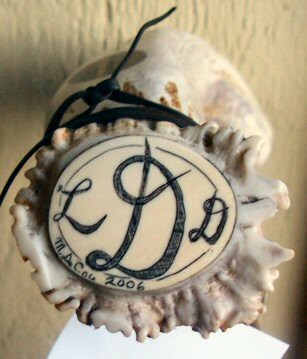 Larry has a long reputation as being a local artisan and craftsman and expert in a lot of different things. I quickly found that his reputation in that regard is well earned. Larry came to the door, and looked me over. I explained that I was wanting to see if he would teach me something about black powder shooting, and that the guys in town at the gun shop had sent me. I figured if he didn’t want to help me, at least he would blame the guys in town for sending me out. That started a wonderful friendship, as for the next 5 hours we talked “blackpowder.” Since I was so naive, I asked a lot of dumb questions. Larry was patient with me, and answered them all. I had no idea what that word meant and let the word pass on by unquestioned the first three times I heard it. Later in the evening, he mentioned the word again, the fourth time. 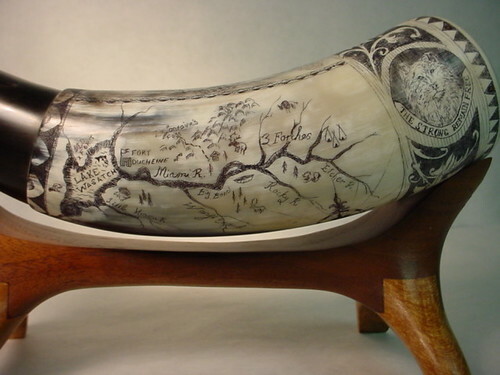 This time, he showed me some of his own “Scrimshaw” work on a powder horn he had built. A wolf looking around from behind a tree, and an elk, and some other things. I looked it all over closely, and couldn’t figure out how it was done. Larry pulled out a bunch of written materials from a large metal file cabinet, and added it to my bag of stuff he was sending home with me to read. Then, he said, “Well, if you are going to try to scrim (scrimshander talk), then you need something to work on, let’s go to the shop.” So, I followed him to the shop. “Let’s go back in the house,” Larry said. It was then at about 10:00 pm that evening, that I realized that I had gotten so involved in the learning session with Larry, that I hadn’t told my wife where I was. I have a bad problem of getting “involved” with things, and losing track of time. She had only been married to me for about 6 years at that point, and this was still a very irritating character flaw of mine. Well, actually, to be honest, now after 15 years, she is not any closer to liking it. I have promised to be different, but then something comes up. What’s a guy to do? My mind is just made to “focus” intently when I am doing something I love to learn about, or do. This is a good trait when I am building something in the shop, but not a good trait when living with someone that moves through life on exact schedules. I understand her frustration completely. It frustrates me to…..................that she doesn’t understand. Ha. I had only gone over to Larry’s house to see if I could schedule an appointment, and so I hadn’t told my wife where I was, figuring I would be back for supper in just a few minutes. When Larry invited me in, we started talking and I was learning so fast, I had forgotten that I hadn’t told my wife where I was. I didn’t even feel hungry at the normal dinner time. I told you that I can get pretty involved with interesting things. As you can imagine, and rightly so, my wife was not too happy to see my dirty cow horns, or my bag of books, or hear about my stories of what I learned with Larry that night. In fact, I think it took a few days before she would talk with me, other than the very minimum it takes to exist in a house with an upset spouse. I tried to be pleasant and let it all blow over. 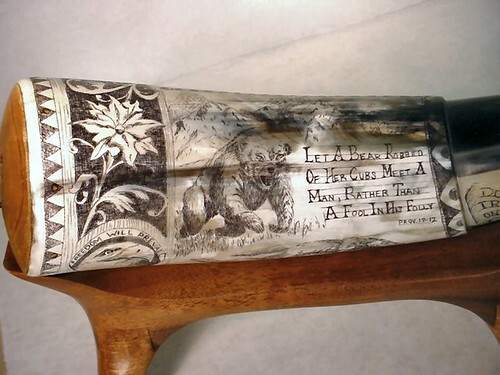 During that “cooling-off” period, I spent my evenings working in the woodshop, building my first powder horn. I built that first horn, taking a long time to do each step, reading and learning before going to the next step. 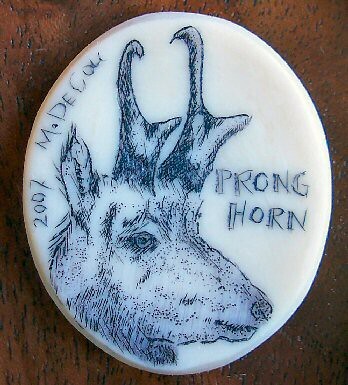 A few weeks later, I had the horn finished. 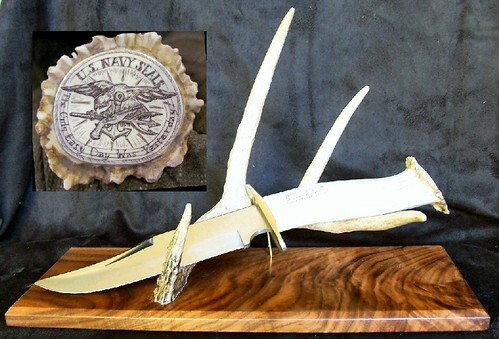 The night before my first Rendezvous adventure, I spent about 45 minutes doing a simple scrimshaw drawing of a Lion & Lamb on the side of that first horn, and took it with me that next Saturday morning to the “Florence, Kansas Labor Day Mountain Man Rendezvous” that Larry told me about on the edge of town. I forgot to tell you, that after I did buy a gun, a Pedersoli over/under double breach percussion cap rifle, Larry spent his Easter Sunday afternoon that year helping me sight the gun in, and tailored the amount of powder I needed for a competition shooting event. This rifle has two barrels, and he helped me sight the gun in so well, that at 50 yards, I put a round ball through the same target hole with each barrel. I was shooting from a bench sand bag. I still have that target with “one” hole in it. With that kind of confidence, I spent the next few months practicing, and learning to control my breathing. Larry had once been the National Champion Fast Draw shooter, and so he is an excellent instructor for competitive shooting. So, don’t give me credit for the 2nd place, it was all Larry’s training. I would have taken 1st Place, but there was some descrepancy and confusion in the scoring. I was thrilled with 2nd, and didn’t fuss at all. The winners each came forward and picked out a prize from the prize table in order. The 1st place winner foolishly selected the “top prize” which was a cheap percussion rifle. I had my eyes on the stained glass piece that Larry made, so whether I was 1st, or 2nd, I would have gotten the same prize! 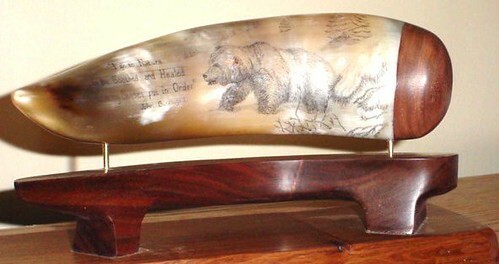 During the Rendezvous that weekend, I had so many people compliment me on the 1st powder horn, that I spent the next few weeks building three more from the other horns Larry had given me. 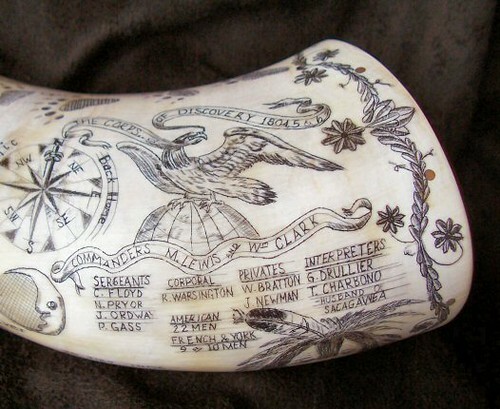 And, just like that, with a lot of practice, trial and error, and research, I became a Powder Horn Builder, and a Scrimshaw Artist. People started asking to trade for them, and then pay for them, and then finally commissioned them. Learning Scrimshaw has been a fun journey, that I am not close to ending yet. 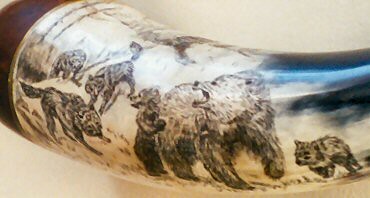 I gifted my 2nd Powder Horn to my new friends “Larry & Nancy” for their hospitality and encouragement in the craft. Nancy is a sweet hearted lady, a great hostess, and she supports this discipling that Larry does with folks like me, by bringing in something to drink, and adding her comments about how talented her husband is, and reminding him of things he has made that he needs to shown. Over the years, I have found her to be an “encourager” not just to me, but to anyone trying to do anything that she runs in to. She tells you that you are doing great, and to keep going. A guy needs a friend like that. They make a great pair. All I had to do was to overcome my fears…......and knock on the door. Since that first evening with Larry, whenever some stranger comes nosing around my shop asking for advice, I have tried my best to help them on their own journey. I have been tested in this many times, and sometimes my own pressures of money and time are hard to manage when someone shows up, but I try to do as Larry and Nancy do for me, drop everything and help. 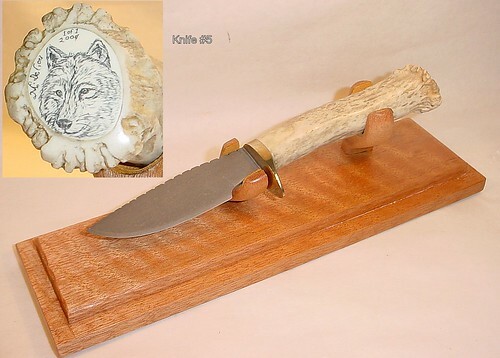 In simple terms, Scrimshaw generally describes the art of scratching, or inscribing of a design on a piece of ivory, bone, horn, shell, or antler, or many other natural materials, to produce decorative objects, jewelry, and useful items. 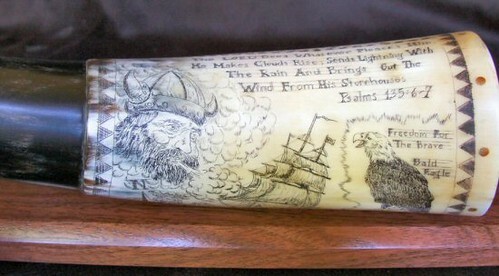 Some experts claim that the only true scrimshaw work is of a nautical nature, completed by sailors on whaling vessels. Other experts expand the definition to include non-nautical motifs. 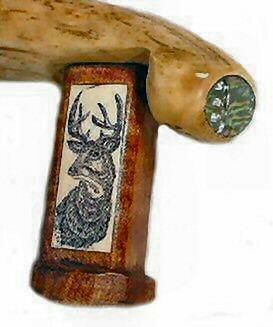 Scrimshaw is an easy craft to learn, the tools are inexpensive and easily obtainable. Finding the materials to work on, the patience, managing the eye-strain and cramped fingers, are the difficult parts of this craft. 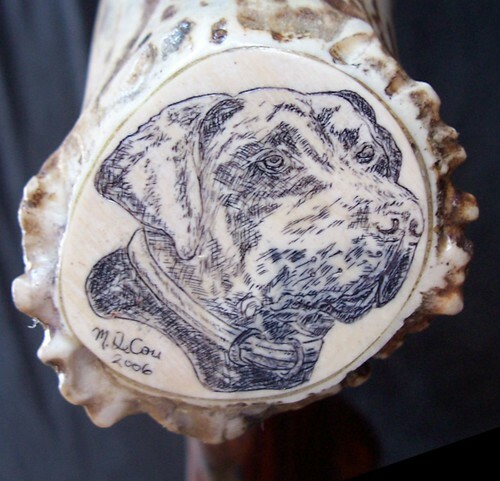 Scrimshaw is wonderful craft with a rich, romantic history. Imagine coming from small town, or farm, eager for the romance and adventure of the sea, pursuing an imagined fortune by signing onto a whaling vessel for a three, or four year voyage. During the whaling voyages, the sailors experienced long periods between the capturing and processing of whales, and once all the chores were done, there was a lot of spare time. Sperm whales were pursued all over the world for their superior oil; the fact that these whales have teeth was of added interest to the sailors. Each sailor was allotted his share of teeth, and bone, to decorate or carve as he wished, and this became a very pleasant way to pass the long hours. 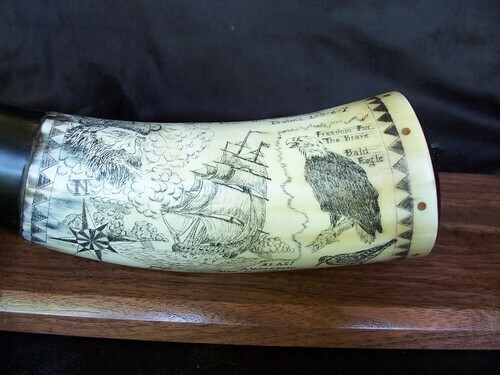 Some of the sailors had an artistic ability and were able to sell, or trade their scrimshaw work with other men on the ship, or with vendors when they reached a port. The scenes that were inscribed often depicted the activities and dreams that took place during their long voyages. 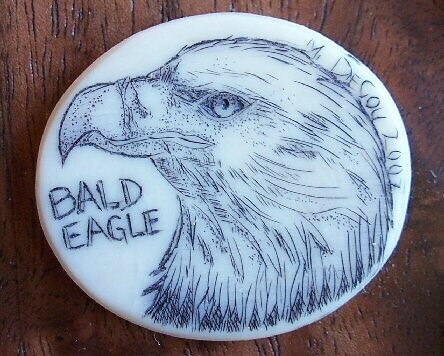 These original scrimshaw items have become some of the most sought after collectibles of Americana, easily reaching auction figures of $10,000-$50,000 per item. 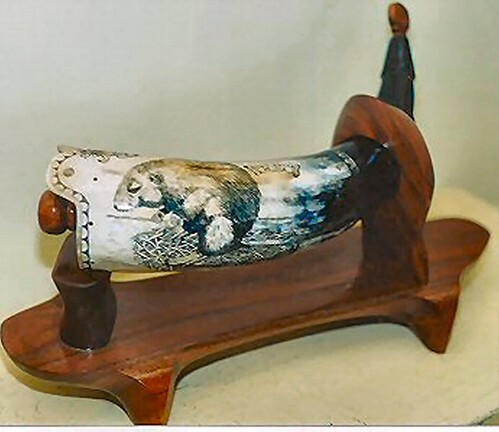 Although most people who have heard of scrimshaw think of it only as crude nautical pictures scratched into the surface of pieces of ivory, true scrimshaw is actually represented by a wide assortment of art and craft forms which were performed with a similarly wide assortment of materials. Kitchen utensils, baskets, pendants, knitting needles, pie crust crimpers, walking canes, bird cages, Dominoes, rolling pins, pipes, Cribbage boards, hair combs, and even tools were all fashioned by scrimshanders. Today’s scrimshanders are still doing pretty much what the old scrimshanders did, only better, using sharper instruments, magnification, better lighting, and steady benches to work at. 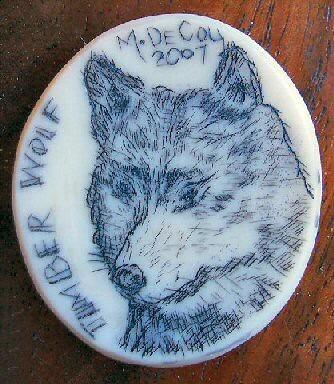 What has become harder today is finding a suitable items to incise with artwork. 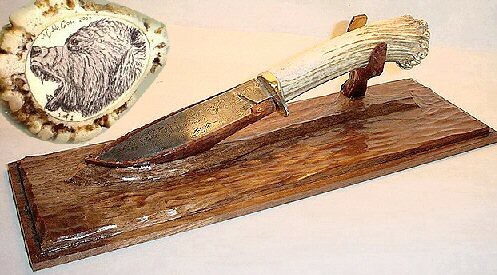 Because there is no more whaling done in this country, the availability of whale’s teeth is limited to what was left from several years ago when supplies were imported from other countries, as importation is no longer legal. 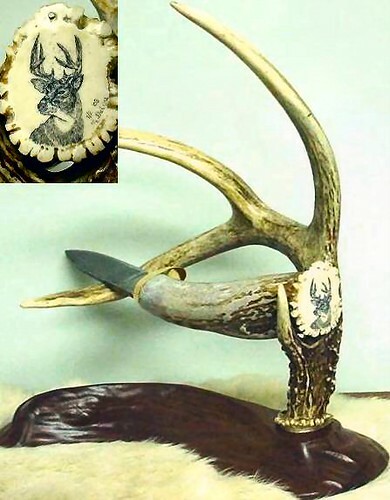 Therefore, today’s Scrimshanders are turning to substitute materials, such as legal, pre-ban, elephant and walrus ivory, deer and elk antlers, cow and beef bone, shell, vegetable ivory, and plastics. The material that is to be engraved is sanded until smooth and then polished to remove all scratches. 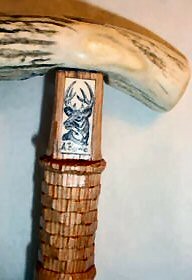 The design is then drawn onto the surface with a pencil or pen, and then the lines are scratched with a knife point, or a sharpened needle. Once the lines are incised, they are filled with black ink, dyes, or oil paints, and any excess pigment is quickly buffed away. 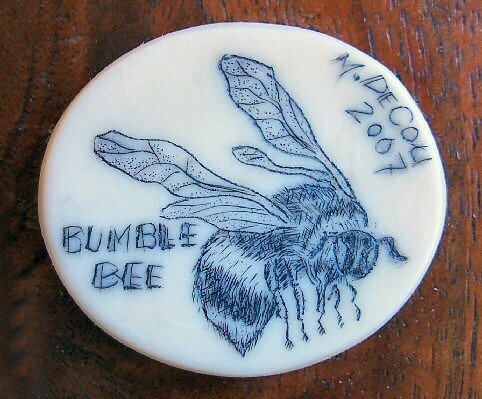 The areas that were incised will be filled with the color. 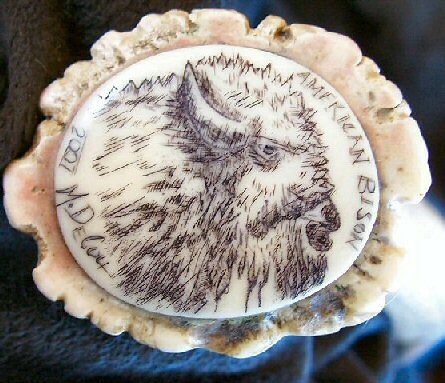 Scrimshaw can be done on any item that has a light, or white background, and that is soft enough to accept a scratch from a hand knife. 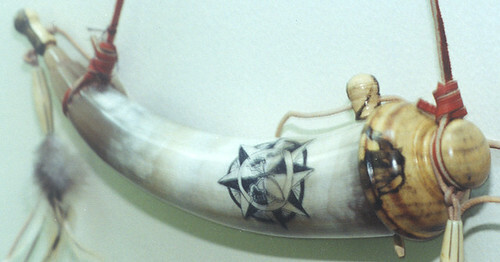 I have a lot of photos from my powder horn work, so that is the medium I have selected for this blog. 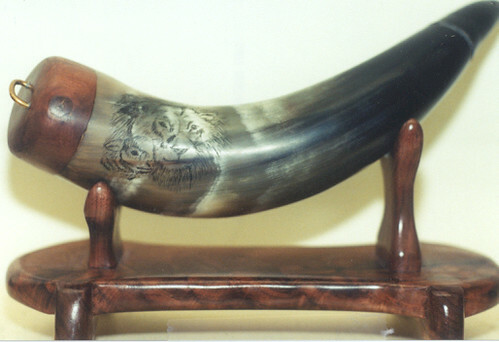 So, the first step is to build a powder horn. Once the powder horn surface has been sanded to 220 grit, I rub it well with #0000 steel wool. Step 2. 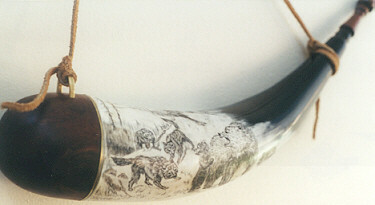 Cut the artwork into the horn material with a knife point. I also use a scribe to scratch lines and use the point for stippling. Step 3. Ink the Cuts. I use either a permanent artist’s black ink marker, or a bottle of liquid printer’s ink. The liquid is just messier, which is not good when using the Wife’s kitchen table to work on. Step 4. Remove the excess ink. I use either spit and my thumb, or #0000 steel wool. The steel wool process is shown in this photo. The black ink sits in the cuts, and so they are left black once the surface ink has been removed. 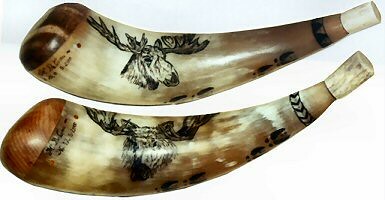 These Moose Horns were the first items stolen from me. It hasn’t been the last for sure. These were taken to a show and sold by a trader in Iowa, and sold, but I was never paid for them. If you see them, let me know, I would like to see who ended up with them. Live and Learn. I watch my business better these days. I just had two walking canes stolen out of a consignment store. Ugh! 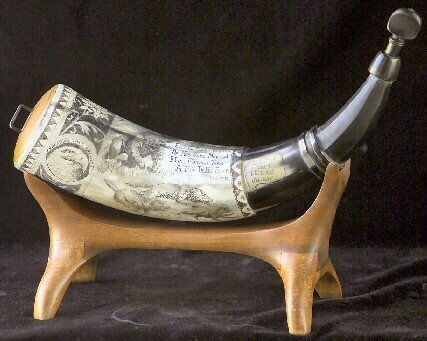 This is a powder horn I built to give to my father last Christmas for helping me with the Western Design Conference show last year, and for the Ford Ranger he gave me. 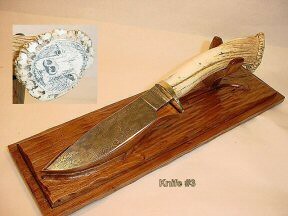 The style of this artwork is “historic folk-art”. 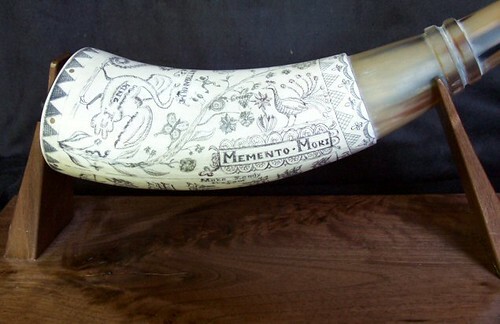 I studied museum pieces of old horns, and picked out elements of the artwork that I liked from a bunch of different horns, and re-created the artwork on this horn.